With a name like this (translating “at the foot of freckle-thrush hill”) there is little doubt that this farm will produce something extra special! 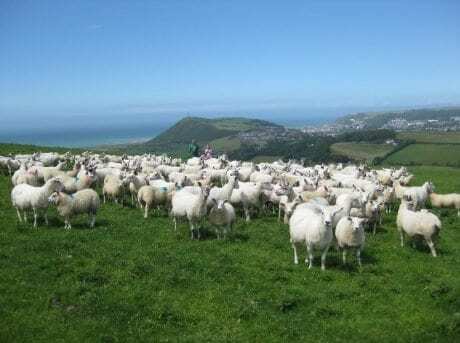 Colin Davies’s land overlooks both the Ystwyth and Rheidol valleys and livestock can view the entire town of Aberystwyth and Cardigan Bay as they graze the fields. With the benefit of the mild sea air and equable climate, he is able to produce prime stock from these lush and fertile pastures. Colin is Rob’s prime lamb producer, rearing his lambs to Rob’s particular specification, using mainly a Beltex terminal sire from Rob’s own flock. These lambs will finish off grass to produce a juicy, meaty and well fleshed carcase to suit Rob’s market.